While taking fewer X-rays sounds great, this also presents a problem. Without X-rays how are we to know the condition of one’s scoliosis? 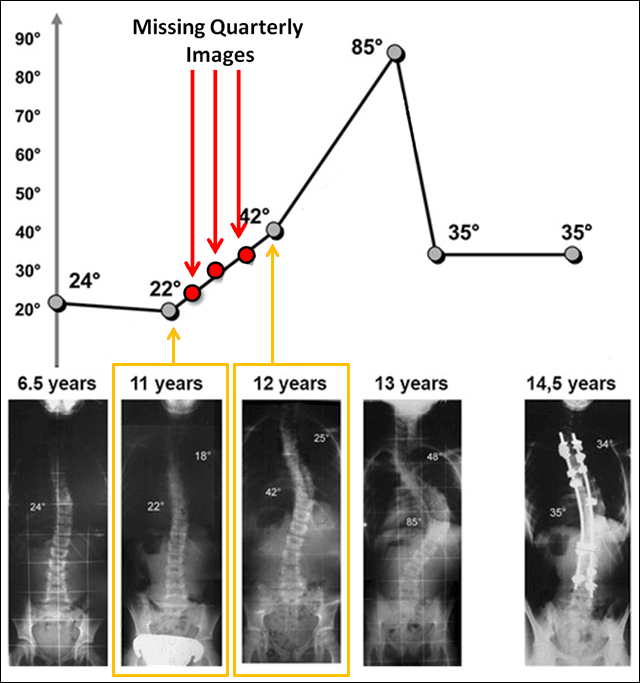 During adolescent growth, the scoliosis Cobb angle can increase in size rapidly in just a few months (Cobb angle is the official measure of a scoliosis curve severity). Taking fewer X-rays means the sudden worsening of mild scoliosis can be missed, which leads to a greater probability of developing severe scoliosis requiring surgery. To illustrate this problem this 11-year-old child with a 22 degree Cobb angle received yearly scoliosis X-rays in order to “watch” the curve.4 At only 22 degrees, typically not even a scoliosis back brace is recommended, but merely a “Watch and Wait” protocol is followed. In contrast, one year later at 12 years old, the next X-ray taken reveals shockingly that the Cobb angle jumped dramatically from 22 degrees all the way up to 42 degrees and into surgical range! Where are the Cobb angle measurements of the patient when her curve was in the high 20’s or 30-degree ranges (red arrows)? They weren’t performed in order to avoid X-ray overexposure! This brings us back to the same problem: We need to be able to watch the spine very closely during growth but need to avoid the frequency of radiation exposure. As a result, doctors space the imaging out too far apart, taking scoliosis X-rays every 6 months or one year. 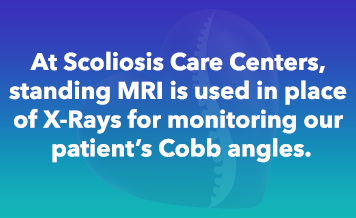 At Scoliosis Care CentersTM standing MRI is used in place of X-Rays for monitoring our patient’s Cobb angles. 1. Closer Observation of Scoliosis. We know the main reason that X-ray imaging is spaced so far apart is to avoid radiation exposure, NOT because of lack of need. There is a definite need to be able to watch scoliosis more closely, especially during adolescent growth spurts. With standing scoliosis MRI we can peer inside the body to see the condition of the curve (Cobb angle) as often as is needed. This information can then be used to help assure the patient continues to grow straighter and avoid surgery. Here is a case of a teen with scoliosis in which frequent imaging results in catching sudden worsening of a curve during the adolescent growth spurt. Note the yellow and red arrows – two 3-month periods in which the patient’s Cobb angle began trending worse. 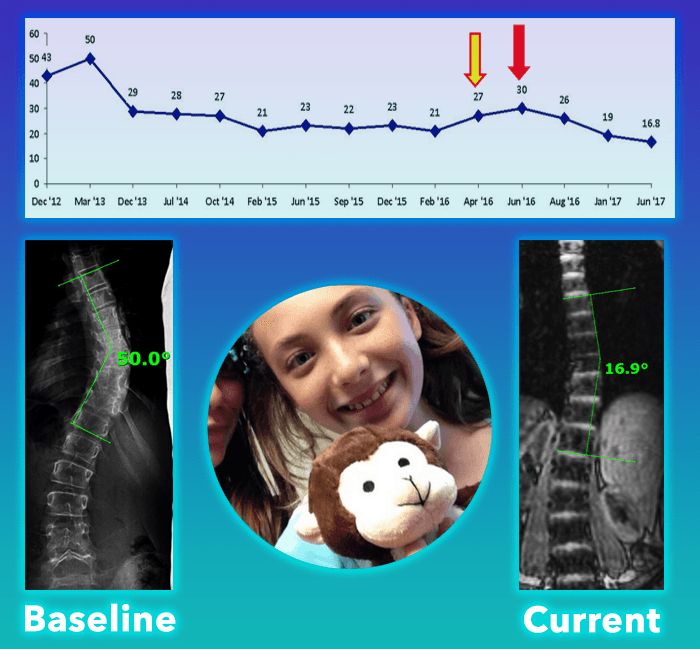 As a result of the close MRI monitoring, we were able to take immediate, non-surgical action to get the teen’s scoliosis treatment back on course. 2. Improved Treatment Effectiveness. It is common practice when designing a brace to eventually take an X-ray of the patient in the brace. X-rays are used to determine if the brace design and fit are having the desired corrective effect on the spine; if the fit is not optimal, changes may be made to the brace, however, this is usually where the process stops.No further X-rays are advisable to test the brace for fear of overexposure to radiation. 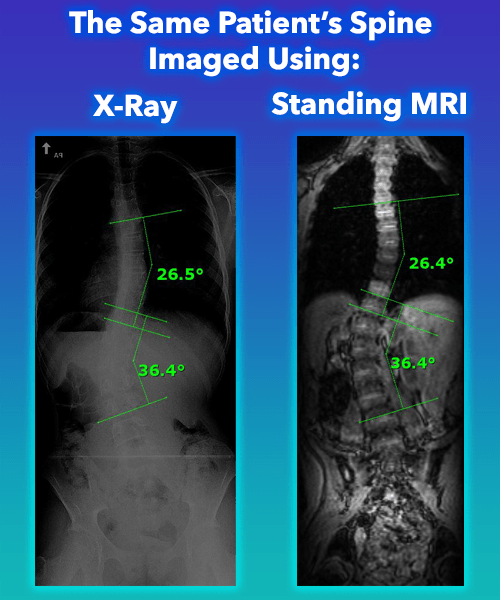 In conclusion, by having a way to image the spine without radiation, a standing MRI can allow repeated imaging of a brace to test the changes made until the design has reached its full potential. 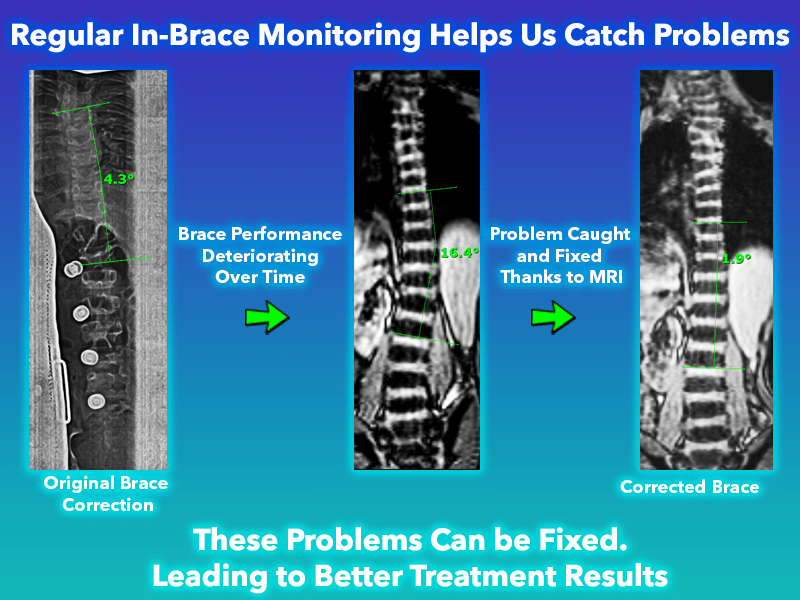 This method of “checking one’s work” can be utilized not only for the brace but for other scoliosis treatments as well. Knott P, Pappo E, Cameron M, et al. SOSORT 2012 consensus paper: reducing x-ray exposure in pediatric patients with scoliosis. Scoliosis 2014;9:4. Ng S-Y, Bettany-Saltikov J. Imaging in the Diagnosis and Monitoring of Children with Idiopathic Scoliosis. Open Orthop J 2017;11:1500–20.